Home Orthodontics & Braces Colored Braces: What Colors of Braces Can You Get? I think that overall the colors are great. 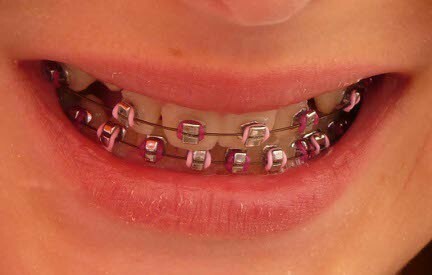 It has helped teenagers to not feel so self-conscious about braces but has made them look cool. Sometimes they can be tacky though like when someone gets really weird colors or when you have boys getting pink! I have to agree, Cheryl. There are definitely some weird colored braces combinations that I’ve seen! I live in County Fermanagh in Northern Ireland. I have been wearing train tracks for a year and then I had to wear “Twin Blocks” for another year. I have to get part of my gum removed in an operation that I have to pay £250.00 for even though I am an NHS patient. Now I have to wear train tracks for another two years and then I have to pay £125.00 to get a retainer made. 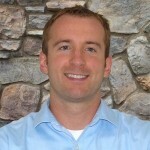 My orthodontist is Mark McCreesh and my orthodontic practice is Cassidy & McCreesh. Why do I have to pay for a retainer even though I’m an NHS patient. My friend didn’t have to pay a penny for her treatment so why do I??? I don’t think it should matter if you are gay or not. There is nothing wrong with boys getting pink. Colour has no gender. It is up to the individual. Those are a popular combination right now haha. I’m getting my colors changed in 2 weeks but, right now I have lime green and teal they go great together. But next I’m thinking about getting black and orange. How does that sound? that’s a ugly color your getting just kidding love to joke a round hahahahahahahahahahahahahah! I have black on my bottom teeth and it doesn’t look like there is stuff stuck in your teeth. And if your not sure on a color put it on the bottom first where it’s not noticeable. that sound amazing Brittany. That’s a pretty name too. Right now I have yellow purple and pink with a colored wire with a heart brackets the brackets are new and I really liked them so I was going to pick the rose but I picked hearts. I’m thirteen and I recently went to the dentist.He now told that I will need braces.. But now the only problem is in having trouble figuring out what colour I should get :(. As I have a dark skin tone and I know pink is a great colour but I don’t want them to stand out too much… Please someone suggest some colours that would help.. If I were you I would get your two favorite colors or just one of your favorite colors and gray or silver! You should just get Teal that’s what I wanna get but I don’t know why people would wanna get two colors I just want one but it’s your choice do what ever you think is best. I have to say, there is nothing wrong with boys getting pink braces, in fact, I think its quite cute and pretty damn individual. our office does a breast cancer challenge with the kids. boys vs girls. you would not believe the amount of boys who choose pink. It is after all just a color. I made the mistake of getting green once when I was a teen and everyone kept telling me I had spinach or something stuck in my teeth. Also, If you get white, no matter how white your teeth are they will appear yellow next to the white! And finally, pink makes it look like you have bubble gum stuck in your braces. These are all things I never considered until I was stuck wearing that color for a month! By the end of my braces-wearing days, I just got silver or gray every time since they made my braces less noticeable than all the other colors. Thank you for your comments, it will help me a lot. Btw, it’s so funny. HI im 12 turning 13 and have no idea whatsoever what colour braces i would like to get (as i need them for a VERY crooked tooth), what would you say would be a good colour??? i was thinking of maybe light blue and lavender, any help. PLEASE? I’m getting braces tomorrow and I’m not sure wether to get pink for fun or light blue or grey because its practicle I have blind hair and blue/green eyes any ideas??? I guess picking colors can get pretty stressful if you have to coordinate with the holidays! Thanks for your comment, Sabby. Could i still get the bands? While 3M self-ligating braces do not require elastic bands to hold the wires in place, with your orthodontist’s approval, you can still choose to individualize your braces with colored elastic bands. However, you probably won’t want to since elastic bands add resistance and can actually lengthen your treatment time and cause discomfort. So, if you talk with your orthodontist and he or she says it’s fine for you to have colored rubber bands, then you could wearthem. But, keep in mind that it could cause some discomfort. Also, due to the extra force on your teeth, it may require you to be in braces for a longer period of time. I hope that helps. Thanks for your question! i have gone with a month of braces and my next dentist appointment is this thurseday and the only colors i have choosen are light green and purple. and my next appointment will be the second time i go. and can you please put up the colors that smilecare dentistry has for patients with braces. Hi Jennifer – I’m not exactly sure which colors SmileCare dentistry would have. Since they appear to be a large chain, I am sure that they have a contract with one of the major companies that manufacture rubber ligatures for braces. I am sure that they would probably offer most of the colors shown in the photo above, but I can’t say anything with certainty. I hope your appointment goes well – Thanks for your comment, Jennifer! I am getting braces on Saturday and really looking forward to it. I think I am getting self ligating braces (as referred to as my dentist as ‘the new type of braces’) but I haven’t been sure if I cannot receive colours and as a 13 year old girl I am partial to wanting some pinks and purples! What sort of discomfort can it cause and how long would it pro-long it? To be honest, the only reason I was looking forward to them was for the colours! Hi Charlotte – Your best bet is to talk to your orthodontist. As I mentioned in one of the comments above, it is possible to get colored bands on self-ligating braces, but it can lengthen your treatment time. This may lead some people to wonder if the extra time spent in braces is really worth it to get colored braces. Hopefully, if you’re set on getting colors with your braces, your orthodontist can find something that can straighten your teeth and allow you to have colored braces. I hope your braces treatment goes well! Thanks for the comment, Charlotte. i got my braces on Thursday, they are fine but they ache a little so i have to keep having medicine. its really hard to eat and sometimes i struggle with bread :S when will i be able to eat propally again? Also when i went on Thursday i didnt get a choice of colour, but the lady that fitted my braces said i will next time, so for now i have silver, and their actually ok, because they dont stand out alot and i dont have a sticky out lip. i had my Braces done on the NHS, so do i still get colour choices like this? Hi Beth – I remember those days when I had braces and eating a piece of bread seemed like torture! The pain should go down after a couple of days and you’ll be able to use your teeth to chew through your favorite braces-friendly foods again. I would assume that the NHS would allow you to choose colors as long as your braces allow for rubber ligatures. Good luck with your braces treatment, Beth! Thanks for your comment! Hi my friend had hers done on the NHS and she got a limited choice of colours of only blue, pink and silver. I hope I’ve helped, and good luck with ur treatment, with only just gotten on Monday I no how it feels. Your Orthodonist could purchase a bag of 3000 ligature ties for $12.00. Hey Lauren – I think you could probably get away with any color. We do see a lot of pink/purple colors in girls. If you want to experiment with a lot of different colors, there is an online braces color chooser that you can use to see how different colors will look on your teeth. You can click here to use it – just click on a color, then click on the teeth or click “All, Even, Odd, Upper, or Lower” after selecting the color. I hope that helps. Good luck with your braces! 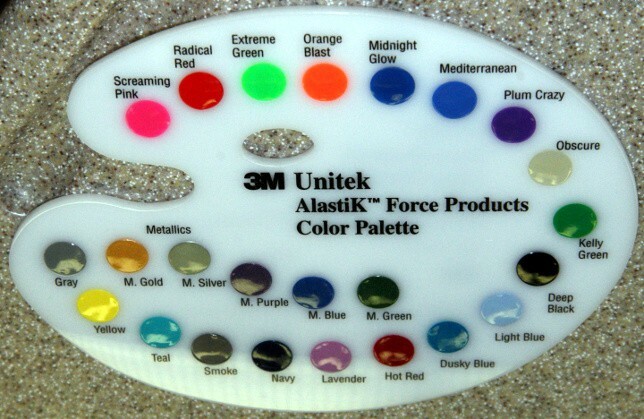 Hi Celeste – The picture above shows the basic colors that most orthodontists have available. If you have any doubts, you can try calling their office and seeing what colors they actually have. I wish I could be of more help! Thanks for your comment – let me know if you have any other questions. I’m really upset because I have damon system braces and i was wondering if i could still get colors because i was really looking foward to it and they didnt give me colors. SO can I get colors for damon system braces? Hi Louise – Since Damon Braces are self-ligating, there isn’t a need for the colored rubber ligatures on them. Also, since they are smaller, I don’t think they would be able to have rubber bands on them even if you wanted them. I wish I could give you better news. You can talk to your orthodontist specifically about this and they might be able to do something for you, but no guarantees. I hope that helps – Thanks for your comment! I went to my orthodontist today and she let me choose colors on my top four front teeth! I was really glad that I could get them! I got screaming pink, orange blast and plum crazy! Hi Louise – Thanks for the update! I’m glad you were able to get some colored bands on your braces. Depending on how your teeth are aligned, sometimes orthodontists don’t mind putting colors on the self-ligating braces. That sounds like a fun color combination! i am gettin braces soon,and i was wondering if orange and purple make good colors? Hi Elizabeth – It sounds like Louise knows what she’s talking about! Let us know how it goes. Thanks for your comment! Heya, i think this site is really sweet it’s 6 days until i get some traintracks.. i’m getting them with detaline (i think that’s how you spell it) anway i don’t know if i’d get the colour put on straight away .. ??? Hi Jade – Thanks for your comment! In the few orthodontic classes I’ve had, I haven’t heard of detaline. If you find out what it is, let me know – you’ve got me curious. Good luck with your braces treatment! I have braces and i also want to get my lip pierced, is it okay or would i hurt my braces? Hi Sandra – Your orthodontist will be able to give you the best answer on this one. If it is completely on the outside of your mouth, it might not make too much of a difference. If it goes through to the inside of your mouth, it could affect the position of your lips at rest, which can affect your orthodontic treatment. Most importantly, you don’t want a piercing to come into contact with your braces because it can work against the forces that are moving your teeth into proper position. I hope that helps. Let me know if you have any other questions. Thanks for your comment, Sandra! Hi Luke – I’m not sure if there is a maximum. The only limit is that you should probably only have one rubber ligature per tooth. If you’ve got brackets on all 28 teeth (no wisdom teeth), then that means you could possibly have 28 different colors. You might want to check with your orthodontist to see if they’re willing to do that many colors. I hope that helps! Let me know if you have any other questions. Thanks for your comment, Luke. Sorry, Cat! 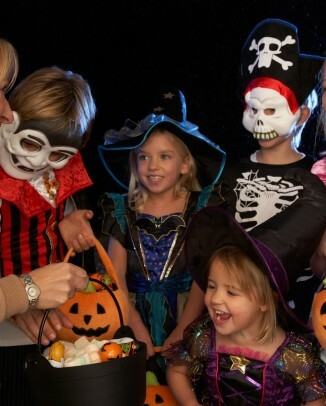 Kids will make fun of anyone who is different… Seems to be built into their nature. Hopefully you’ve recovered from that and now have straight teeth to show for your time in braces. WAIT how old wer u? Hi Valerie – Sounds pretty patriotic and festive! Since it’s less common for adults to wear braces than kids, it seems that most adults try to hide the fact that they have braces. If you had colored braces, they definitely would stand out! You can ask your orthodontist where or not you’ll be getting self-ligating braces (In that case, you don’t need the rubber bands to hold the wire in place.) If you do have to get rubber bands put on, you might try a more inconspicuous color such as white or silver. Keep in mind that white may be more likely to stain depending on what kinds of food you eat. I hope that helps. Let me know if you have any other questions. Good luck with your braces, Valerie! Don’t worry about standing out! Anyhow, you can always get invisible braces as well, I am sure your orthodontist has a pair of them. I am 43 and just had my second set of metal braces put on. (first set at age 16) I love having the colors to choose from. I am wearing the Metallic Blue at the moment and love matching my braces with my business attire and casual clothes. I plan on the Red and Silver combo for Christmas this year and plan on the Hot Red for Valentines day. I feel like I am a teenager again and I am having fun this time around with my braces. Enjoy them and have fun with it, it sure will make the time they are on go by quicker! Obviously there are many different combinations. You might want to ask your orthodontist which colors they recommend for people your age. They’ll probably have some good ideas since they see lots of people with colored braces! I hope that helps. Let me know if you have any other questions. Thanks for your comment, Brooke! thanks.how many times can i change the colors? Hi Brooke – You will more than likely be able to choose new colors at every appointment. Depending on your treatment, you will probably have appointments every 1-2 months or so. Hi Brooke – Depending on what you eat, white or light colors might stain easily. Other than that, go with whatever floats your boat! I love the look of colored braces! To me it is another way to express your personality ( nail polish, lipstick, etc.) Back when I was in school, over 25 years ago, my friends with braces didn’t have the colored ones, and they were VERY self-conscious about their braces. I think it’s great that these colored bands are available, as I’m sure it helps many teens overcome their self-consciousness about smiling or showing people their braces. I agree Debbie – it definetly helps them get over the awkwardness of getting braces. Thanks for your comment! The first time I had braces, I had the self-ligating braces. But my retainer broke and now I have to get them again. This time I’m going to a different orthodontist so I can choose my colors. I want to get bright pink for my braces, because pink is my favorite color. Some people give odd reasons for their colors, i just love pink. Sounds like a good enough reason to me, Jessica. hello. I would like to ask would the color Obscure be good to choose for braces ? Hi Eniko – Obscure can be a good color as it makes your braces blend in better to your teeth. With lighter colors, sometimes they can stain if you eat certain foods with lots of color like tomato-based foods and curry. If anyone has a photo of their braces colors for Eniko to look at, you can upload it using this form and I will post it. I hope that helps, Eniko. Let me know if you have any other questions. Thanks for your comment! I am getting top braces on Wednesday, and I was wondering if you get to pick colors right when you get them on. Hi Kate – You should be able to pick colors as long as you’re not getting self-ligating braces. I hope that helps – Thanks for your comment! Let me know if you have any other questions, Kate. Hi Kelsey – I’m not too good at color choice, but my wife says turquoise/blue will help your eyes pop since it’s the opposite of brown. Good luck with braces! Hey Tom! I just wanted to thank you for all the helpful tips I’ve learned from you! You’ve made this whole deal a good bit easier! Thanks! Hi Anna – Thanks – I’m glad it helped, Anna. Good luck with your braces! I have a question for you. I got my braces about 3 weeks ago. They only put the ligatures/colors on the middle four brackets on top and 5 of the middle six brackets on the bottom. I was wondering why this would be?? Thanks! Hi Anna – It may be possible that your braces are self-ligating (that don’t need the colored ligatures) and they just put the colors on the front ones so that you would have colored braces. Just a guess – If you want to know for sure, I would ask your orthodontist to see why they did that. I wish I could be of more help – if you find out, let me know. Thanks! I have a question about power chains. Are they only used for closing gaps or can they also be used to create a little bit of space between teeth??? Hi Anna – They are normally used for closing gaps. As far as I know, there are better ways to create space between teeth than pulling the adjacent teeth together with a power chain. On my top teeth with ligatures, the colored bands were put on in a “two slashes” form. Looks like this: “\\”. However, on my bottom teeth with ligatures the band goes in an “O” shape like most are seen in. Hi Anna – They could have done that to change the amount of tension that is holding the wire in place, or it could be the design of the bracket. If you find out the exact reason, let me know. It’s good that you’re so interested in your treatment. Good luck with your braces, Anna! However, this was a decision I made myself & in the end it'll make me very happy. I have a color called rose on my braces right now and I love it 🙂 I'm thinking to get purple and silver on my next appointment. Or who knows maybe some blue too. Unless I chicken out and get a color that will show less. Do you recomend gray? Hi Vanessa – My wife said she got gray a lot because it blended into the braces, so it all depends on whether or not you want people to notice them, I guess. Good luck with braces! Hopefully they don’t hurt too much. Hello! Next week i’m getting braces and “screaming pink” and “extreme green” are the best colours for me. I’m 14 and i think that the teenagers love these colours. good luck, i love those colors as well .. I loooooooooooooooooooooooooooooooooooooooooooooooooove those colours to. I like them cuz Avril Lavigne has them on her bangs! Im getting braces soon and im really scared because some people tell me they hurt alot so im really scared… do they hurt ? Hi Chloe – You might want to check out this article, Do Braces Hurt? Feel free to leave a comment there if you have any additional questions. Thanks for your comment! I am having my final consultation next week and the orthodontist was saying how I have a huge over bite (I can fit my thumb in between my teeth) and that he wanted to pull my bottom jaw forward and my upper jaw backwards. Also my top teeth kinda stick out slanted like…as you can tell I have a messed up mouth. I was just wondering if you could tell me what my orthodontist might want to do because I am inpatient and I cannot wait til next week! Also do you know how long after having your consultation that you actually get braces? Hi, I’m getting my braces next week but I’m getting self-ligating. I really want colour and I have heard about getting coloured arch wires? I have also heard of coloured ligatures, whatever those might be. Have you heard of any of these? im 13 and i have too get braces im going too the orthadontist october 19th im scared there gunna hurt. Will they hurt? What color should i get i want pink but someone told me it will look like i have bubble gum stuck in my teeth what should i do ? Please Help!!!!!!! Thank You!!!!!!!! Hi Danielle – If you go for a bright pink, I’m sure it won’t look like bubble gum too much. How much braces hurt depends on the person. The first day or two is usually the worst, and sometimes it’s really not all that bad. You can check out this article: Do Braces Hurt? Come back and leave a comment after you get them on to let us know how you’re doing. Thanks for your comment! Hi! I am getting braces and im also 11. Hello Tom. I need some help. I was looking at braces and stuff online when i came upon your website. I get braces in 3 weeks and spacers in 2 weeks. I was thinking about getting orange and blue braces (by the way-i’m 11) and i just wanted to know if you thought that was smart. I am really nervous because i am very scared that they are going to hurt when i get them on. I was just wondering if you knew if you could get colored rubber bands (not on the brakets–just the connecting rubber bands that connect your top to the bottom in the front) because none of my friends have to have rubber bands and i love color, so i am afraid that i won’t get any color and i will get something dull. Thanks and i hope you get a chance to answer! I know! I think i am going to get those colors now! Hello, i have to get multiple teeth extracted before getting braces and I was wondering how much time should be in between the extraction and the braces? the teeth extraction is on the 17th of jan. and the braces are feb 26th so is that too much time between the extractions and the braces because i’ve read that there shouldn’t be extended periods of time between teeth extractions and getting braces. either orange, red, or purple. Thanks for responding Beau:) I was also wondering about teeth shifting, cause when you get your braces off if you don’t wear your retainer often your teeth can shift back to their original position, and i’m not sure if they’ll give me a retainer after the surgery so i was wondering since there is more than a month between the surgery and getting the braces can my teeth shift significantly after getting some teeth extracted? I’m getting braces probably this summer or some time in December (were not sure yet) and I was wondering how do I know beforehand if I need ligature braces or self-ligating braces? Also, my best friend says when she first got her braces, they caused her a lot of pain because they cut the inside of her mouth. Will that happen to me and will I get used to it quickly? One last thing, my friend recently got her larger rubber bands that fit around her top and bottom braces and she says they hurt really bad. Is this true? Sorry for all the questions, I’m just a little nervous about the whole thing. Hi Bryanna – Our orthodontic training wasn’t extremely in-depth as I am studying to be a dentist, not an orthodontist. With that said, I’m not sure how an orthodontist determines the need for self-ligating vs. ligature braces but I plan to research it and write an article about it soon. If they do cut the inside of the mouth, usually the mouth forms a tougher layer of tissue that will stop the braces from cutting them. You can use wax also to keep the braces from cutting you. Moving teeth can hurt. My braces usually only hurt for a few days after I got them adjusted. I’m sure it will go well for you – good luck with your braces treatment! what exactally though? Also Is the head ste hard to have? How big is the cuts because my mom will make me have saly water to heal them fast so I don’t complain. For me, I never use the wax anymore because it only delays it cutting your gums. If you take off the wax, it’ll just go ahead and cut you then. What I do, is I go ahead and let them cut me, so I’ll be used to it and they’ll heal over while the rest of my mouth is already hurting. Can you get colored bands with clear braces? Your name is really cool 🙂 I dont know if you did it on purpose, but your name is the same as a Christian artist (and author) I like. hey how many colors are we allowed to get on our braces ?? Hve ya gt them yet? r they sore? Okay I am Kayla and I have to get braces in January and I’m kinda scared that it will hurt.. will it hurt or will it be okay and would purple and teal go together?? Thankss!! hey im getting my braces in january to! janurary 3rd! shhod i get purple or orange??? hi kayla. i think that red and orange or purple and orange would be good for you. I would say blue, green, purple, or pink (I have brown hair/eyes). I was wondering if red is a good color for braces? Thanks. I’m getting braces Jan. 3 and I’m planning getting them all hot pink. Is there a problem with pink? Also, what is the worst part of having braces? Hi im getting braces soon but the dentist said that my baby teeth grew into my jaw bone, yet they are still putting on the braces before they do the surgery to get the teeth removed, why is that? I’ve heard that colored bands hurt more than regular bands. Is this true? Hey my friend just got braces yesterday and she is in a lot of pain right now I am just wondering because I’m getting braces in like 2 or 3 weeks will they hurt. Oh and I was wondering what colors I should get and I’m a Tom-boy so I don’t like pink because it makes me feel like a girlie girl. I seen teal and purple together, thats real cute. Taytum I had braces for 4 days now, and I still can’t eat the way I want to the pain is easing away…it doesn’t hurt to get them on, but 2 hrs later you will feel it. Just take some pain killers for a couple of days and you will be fine, in about a week you should be feeling no pain at all. Mine it took like 3 weeks but idk why and the pain didn’t strt till the next day. They only hurt for the first day or so. I’m a sensitive person to. Take an Advil or some kind of pain relief before you go and after the medicine wears off. Just don’t forget to take it or your mouth will hurt really bad! hey rachel i hate pink too!! What colors are popular for girls 12-14? Any responses are greatly appreciated! Pink and green are always cool. and light blue/teal and purple!! Do not get yellow, brown, clear (usually will stain), or dark green!!! Hey, I’m 15 years old and i had around 6 appointments so far on my braces. The problem is that why didn’t my dentist ask me which colours i want for braces. All i have now is just plain silver and it looks so boring. Is it because he doesn’t have any colours or is it because i have to pay extra money for colours? I have an appointment tomorrow with my orthodontics. I don’t know what color braces I should get. I was wondering if you can help me out a little ? It would be so great if you could. Hi,well im getting my braces the day after tommorow and i really don`t know what to expect.Anyways what colors do most 12 year olds wear? um… im getting braces on friday and just wondering does it cost more to get more than just 1 color? Hi Miriam – It shouldn’t cost any more to get more than one color. Good luck! Hey, im getting braces put on next thursday and im worried that people will laugh because i have to have the elastic bands to help my overbite/cross bite:/ has anyone on here had this problem?!.. i might be getting braces in april i have brown eyes and a carmel colored hair with red highlights what color would be a good choice? i was just wondering, can i combine some colors for braces? cause i love blue soo much! Hi Jade – Yes, you can combine colors as long as they are all single bands (not a powerchain) I think light blue and teal would work great. There are “uncolored” braces that don’t need colored bands to hold them in. Talk with your dentist/orthodontist to see which kind you’ll be getting. Good luck with your braces! oohh!! tnx so much for your reply!! i have my braces now. so i agreed with those with rubberbands. yes your right! light blue and teal works great! and it matches our uniform! so my classmates started calling me blue girl,. well what can they do i love that color! tnx for your reply Tom! P.S. my braces just hurt about 10 Hours! and then my teeth back to normal like i dont have braces at all.! hi tom, theres so many Jade!! i reckon why it change from purple to green..
What is the difference between self ligurature, ligurature, and regular braces? Thanks just wondering getting braces soon. Hi Abby – Braces are either self-ligating or they need a rubber ligature to hold the band in. The self-ligating ones have a metal door that holds the wire in place whereas the braces requiring ligatures are metal, but have a rubber band (usually colored) that holds the braces wire in place. I hope that helps! I am getting braces in a few weeks (finally) and I wanted to get the colors teal and gold. Do you think they would go well together? What are 2 colors that alot of people get? Hey I’m a teen and I always get two colors for every other. I think it’s fun to show your “true-colors” (lol pun) but really it’s just a way to express your self kinda like earrings. I think it’s fun to get spunky colors like extreme green and plum purple together because despite what others say I really like it, and I think it’s what’s fun about braces! Hi, I got my braces 2 months ago, and now I have a wire sticking out at an end where the braces stop. Is that because of my teeth moving and the brackets going with the teeth? But, I have been putting wax on the wire so I have no pain until my next visit. … But so far being in braces I can’t feel them in my mouth and are giving me a better smile, can’t wait till I have a straight smile. I might get braces …not sure what color! So many! You get to change them? Hey, I hve braces and I do agree there are many colors . But yes you do get to change out what colors you get every appointment. Hey, I am possibly getting braces soon. Have my first appointment Wendsday to get my exray etc. However, I have a tongue piercing. Will that affect braces? Is it possible to get green, white, and orange? I want to go with the colours of Ireland. And does it hurt to get braces? Hi, Tom. I just wanted to say that this is a great article! It really helped me a lot. I’m getting FastBraces, otherwise known as Viazis braces. They have triangular brackets with 3 “prongs” instead of 4. Do you know if I can get colore elastic ligatures with these? If not, could you take a look at a picture of the fast braces and get back to me ASAP? Thanks! I think that the color braces are cool. If your a kid it WILL make it easyeir and more fun to get braces! hi im getting braces in few days and im wondering what color is good for a 13 year old girl ? Hey, I’m getting braces in September and this definitely made it more exciting! thanks I’m getting extreme green and screaming pink. Cant wait! Hey im getting my toung pierced really soon but i have breces will the toung piercing affect them? Hi, I’m getting braces soon, and I rather like the idea of the coloured bands. But my dentist didn’t really elaborate on my braces much, so I don’t know which kind I’ll be getting. So I was wondering how common self-ligating braces are, and if they’re used to treat special things? I have an overbite, and a gap between my two front teeth. I’m rather anticipating getting my braces with the coloured bands, so I was just wondering what self-ligating braces do. Hi, I’m getting my braces soon and i was wondering if I can still play the alto saxophone in my school band with braces on ? Please reply quickly I really have to know!!!!! Hi Andrea – I would think you still should be able to play. It will probably require some changes to the way you’re used to playing, but once you get used to them, I would think you should be able to play the saxophone as good as you can now. Good luck! I’ve noticed that you should stay away from the colors black white and yellow. They definitely make your teeth look weird. Is neon green a good colour to get? And what about black because some people say they make your teeth look yellow? Hi Amber – Neon green could work. You can try getting one at the orthodontist’s office and holding it up to your teeth to make sure it’s what you want. White really seems to make people’s teeth look yellow. Black might also make it look yellow, but I have heard that some people think it makes their teeth look whiter. Some good choices to make your teeth look more white are darker colors like dark green, navy blue, and maroon. Keep in mind, it’s not permanent – so if you don’t like your colors, they will probably be changed at the next visit. I hope that helps – good luck with your braces! Sorry to annoy you but can you please respond to my question, because I’m getting braces in about a week ? I am 19 years old and I am receiving braces in a few weeks. I decided to go with the traditional metal braces. What colors look most natural and non noticeable on teeth? Im gonna have to get braces and i want to get gray and blue. But i heard there is a glow in the dark and i want to know if it will match the blue and gray? 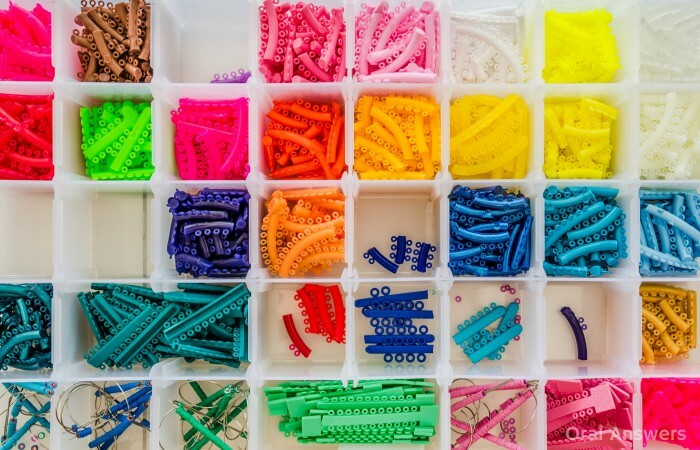 Do you get to choose your color the first day you get your braces ?…How many colors can you get at one time? Just wanted to say thank you very much for making such an informative website! It has really helped me alot and has made me seriously consider doing something about my teeth. I’ve always had a dental phobia, and have always hated my teeth.I’m a female in my early 20s. I’ve gone through life never being able to smile or laugh, or even looking directly at a person when speaking to them because I don’t want them to see my teeth. My teeth are all pretty much okay-ish, apart from the top right tooth, it is very crooked, kind of turns inwards due to overcrowding, I’ve often fantasized about knocking the tooth out, I hate it that much. I’ve never really been to a dentist about it because I’m ashamed and I know I probably can’t afford it anyway, and even if I could afford braces I don’t know if I could handle having them on for so long as things regarding teeth highly irritate me. To have my crooked front tooth removed and replaced with a straight dental implant, even if it has to be smaller than my other tooth, just to stop it from being so obvious. It has severely effected my quality of life and self confidence. I rarely even talk to anyone because I’m so ashamed. Do you have any suggestions of what could be done, in alternative to braces.and how much it would cost? I know dental implants cost around 5k, and I could definitely see myself having it done so it’s just over with straight away without wasting anymore of my life being a recluse. Ive just realized how quickly life is passing me by. It’s depressing. If braces are my only option, how much do they cost? And how long would someone like me need to wear them? My front bottom teeth are also a bit crooked but nothing as bad as my front tooth. 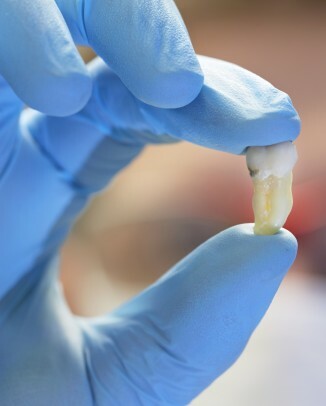 Or is there some other procedure I could have done to solve my problem, such as veneers or a bridge? Thank you so much for reading, it means alot to me, I’ve never even had the guts to anonymously ask anyone about this because it just.. This deep seeded shame I’ve felt for a long time.. so I generally try to avoid it altogether and not even mention to word “teeth” in fear of drawing attention to my own, the word teeth almost makes me cringe, instantly reminding me about my own. People don’t realize how much bad teeth can effect your confidence. I often get told I’m a pretty girl, but if I wasn’t covering my mouth I’m sure they’d have a different view. Sorry for sounding like a sook. Thanks again for listening. Wow it feels nice to get it off my chest! You sound like a wonderful young lady!! 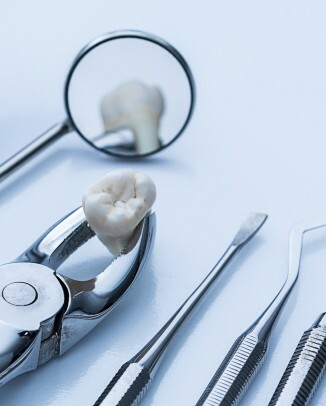 Please consult a dentist, there are many that offer a free (or low cost) initial consultation including x-rays and then they can fully describe your options. You have much to offer and a new smile will do wonders for your ability to also help others. Seek referals from your friends or on-line reviews of dentists or orthodontists in your area. Thank you so much for responding. I’ve noticed Tom hasn’t been responding much lately, so I stopped coming to this site to check..I randomly found this site again while searching for wisdom teeth removal after care and realized it was the same site I visited last month. Surprisingly the ortho thinks straightening my teeth will be easy. (I thought I was going to be a horror story) my teeth seem so bad to me because everyone in my town seems to have perfect pearly white teeth.. So I’m truly ecstatic to know my case won’t be too difficult to treat. I was hearing horror stories about people who needed braces for 5 years and up, and I didn’t want to take the chance of that happening to me.. But I’m finally ready to take the plunge, and hopefully in a years time I will have straight teeth and be able to talk and smile without hiding. Thank you so much for responding, it’s nice to have some reassurance. i am getting braces on the first of october im excited and my teeth arnt crooked but spaced horribly and i have a over bite i hate my teeth my dentist said max 2 years but if i do everything rite it will decrease the time dramaticly so as long as you where and do what you need to it should be rite around when your dentist says maby even shorter i was going to tell you about payment plans but looks like you beat me to it!! im 16 and braces are so common in school now football players have them almost everyone but y would you just leave your teeth when you can fix them my dentist said i would be a very good canadate for invisalighn witch is a invisable braces and i didnt want them because everyone around me is getting their teeth fixed but even if i got them you wouldnt be able to tell i was making an effort to fix my smile! so i believe you should look at it that way at least you are making an effort and everyone can see that i hope i helped just think positive and learn to love them my sister had a horrible dentel phobia but my dentist is so good she loves it now (she is 29) wen you go in you get i think three shots in the back of your mouth but i swear you can not feel anything at all i got a root canal and i almost fell asleep no joke it felt good like i was getting a very noisy massage so if you live in the indiana area i could definatkly give you my dentists websight! Aw thank you so much beck.. It’s sweet that people are so accepting of braces these days.. You’re so lucky you’re getting braces when you’re younger.. I wish I had gotten them as a teen.. You have a much better success rate because the bones haven’t formed properly behind the teeth yet. I’m worried that when I get mine off, they’ll end up crooked again.I’ve heard alot of people saying that happened to them (because they didn’t wear a retainer) and that’s quite a daunting thought.. You better make sure you wear your retainer when you get them off! If I were 16 when i got braces..I know I would have never worn a retainer.. But as an adult, I’d rather it be done right the first time and never have to do it again! When I was in primary school people used to bully kids with braces.. But I’ve realised these days it’s kinda in fashion to have braces.. We are in the era where technology is cool, back in my day, you were a geek if you spent even an hour a day on the computer.. Now you’re weird if you don’t spend time on the computer. Even if it wasn’t more acceptable these days, I still would smile proudly with my braces.. Just because I’m so happy we have options to fix our flaws… Technology is great these days. When I wrote that comment I honestly thought I’d never build up the courage to go see an ortho.. Been almost 3 months of braces and my teeth are almost straight already. Except my overbite needs to kinda move back.. It’s more of an alignment problem rather than crooked teeth though.. Seriously my teeth are almost straight after just months, I am in awe at how quickly teeth move! They have become a fact of life now.. At first it was so weird. Have you got yours fitted yet? The first few months it feels so weird.. Now it’s second nature.. I still eat chocolate and hard foods though, and even chew gum and stuff. You just have to learn how to do it, and do it slowly and break things into small pieces.. Can’t believe I avoided this for so long, I was a sook.. Now I’m least ill have nice straight teeth before I’m 25. It sure beats having crooked teeth my whole life.. Don’t take them for granted, you’re so lucky you have parents who love you enough to pay for braces..not all of us are that lucky.. Many parents won’t, even for kids with severe teeth problems.. It’s sad.. I always refused to see the dentist, I was a stupid kid.. Never thought of the life long consequences! Anyway, cheers TO US, in just a few years time, we will be smiling with our gorgeous straight teeth! Teeth are SO important.. From confidence, to job opportunities, to even dating.. Crooked teeth are frowned on in western countries.. So everyday instead of waking up thinking damn these braces are annoying, we should instead think, damn we are lucky to have these tools to provide us with confidence and opportunities in the future.. Being able to smile at a man to flirt is one thing I’ve never been able to do.. So lets be happy someday we might be smiling at our future husband across the bar haha ^_^ good luck with your treatment! i hat purple then orange 🙂 i still dunno what to chose for my next appointment.. red maybe? Get a dark color. Dark magenta, black, and dark navy blue look good. Don’t get dark green, it looks like spinach. Don’t get red, it looks like you have cool-aid stains on your teeth. Don’t get white or yellow, it makes your teeth look yellow. Don’t get pink, it looks like bubble gum. Don’t get mixed colors, it looks childish and weird unless the combination is really similar and if it works. Teal looks okay, but Dark Magenta is definitely the best. If your dentist doesn’t have it, than get a dark red or navy blue. Dark purple looks okay too. my mom and my sister have red hair and the colors that they look good in are: a calm blue a calm gray pink a dark kind of forest green (all tho i wouldnt get really dark or really bright braces tottaly up to you) the colors i never let my mom where are: PURPLE never ever do i let her where purple! black just makes her look mean but on my sister these colors look good because my mom is a dark red and my sister is the natural normal red color BUT she puts lots of blond highlights in her hair so it looks more of a strawberry blong witch is georgous by the way im 16 and i get my braces on the 1st of october some people say they hurt lika ____ and some say they bother them like a discomfort but no pain and some say they are barely noticable! so i am getting braces on the first of october i have a few thoughts in mind but i just waanted to say i have been on this sight for like 2 hours and find it very helpful i have heard diffrent things from diffrent people like it hurts lika or its just discomfort or it doesnt hurt at all but i guess it all depends on you im bout to find onut in 4 days wish me luck!!!! I’m getting braces tomorrow and don’t know what colour to get? hi! i get my braces in two days. Since Christmas is just around the corner, red and green sound practical. however, I feel like Red will look like kool-aid and Green will look like spinach. I feel like getting pink would be nice. I think pink and blue or pink and green would be too much for my mouth. Idk, does that sound good? Hi Maia – Right now, I think most people will be accustomed to seeing red and green and won’t think that you have koolaid and spinach goin on. Good luck picking out the right colors! Tom, don’t you ever get sick of agreeing with people’s color choices? I’d go insane being asked thousands of times what color looks good on ___ insert hair color here. You must have great patience. Lol, not really! It’s interesting to see some of the combinations they come up with. I think most anything looks good, so maybe my opinion isn’t the best judgment of whether or not it really looks good! I Am Getting Braces Either January Or February, But Not Sure What Colors, Any Suggestions. Its okay don’t worry or stress about the colour in getting my braces in January\febuary too I was thinking dark red looks good Sewell as light blue but then again don’t worry its like a blip in your life if you choose the wrong colour it won’t stay that colour for long as the colours generally fade. I m gonna get braces Monday and gonna get pink and red for v day but what is it like getting braces? My name is Meagan and I went to the Ortho, they said that they would call in 4-6 weeks I was just wondering how long you think it takes. I also would like to know if they actually call you or you have to call them because its been so long, I have heard of cases like that. Im also thinking of getting teal on top and a pattern of purple and teal on bottom. What do you think? Is there anything thats bad about those colors? Also do you get to pick your types? Like my friend has I think what they call railroad or train tracks…. Or do they give you what braces they think you need? im wearing self-ligating braces but my ortodontist put rubber bands on my braces. im confused. Hey all, I’m getting braces soon and I was thinking about colors. I really like maroon but I’m not sure what they’ll look like on… Ps. I really don’t want orange, pink or purple. Any suggestions? Also, my friend’s braces keep breaking when she eats. Is this normal? All replies much appreciated! Hi Jane – Many offices use the 3M bands, but if not, they will likely have similar colors to what you would like to have. Some general dentists do braces, most don’t, so you will usually go to an orthodontist to get your braces. As far as hurting, when they glue the bands on your teeth you shouldn’t feel anything. It does ache a little bit AFTER you leave the office and the braces start working to move your teeth. Good luck! Hi, I am getting My Braces put on tomorrow and I was wondering what kind of colors there aare to choose fromZ? Thank you for that! I have pink and orange but I get them Changed tomorrow! Any suggestions? if u like it teal and pink? Hi . I’m getting braces today :s I’m pretty nervous , but I love the colors exreme green and teel 🙂 would they look good together ? Those colors are great I’ve had them on for a while and the color gets better as they fade!! Getting braces soon but don’t know what colours to get, I wanted to get green annd black for my school colours because when I get them I will have 6 weeks left in school and then 6 weeks before they are tightened so then I can change the colours when I leave the school but I’m afraid to get the colours because they are the main colours that look like food!!! 🙁 Plz help!! try a light green and maybe a gray a darker one so it wont be as bad! good luck….is their any pain getting them on? It entirely depends on what type of braces your getting intill then keep it in mind just in case I would suggest the first time whatever coulour you get it doesn’t matter as you have them on for a short time. im getting my braces on in a month! idk what colors to get and will they hurt i getting scared after reading some comments about how much they hurt what foods are best to eat after ypo get them on??? and what colors whould look best on me im kind of pale and have light blue eyes and dirty blonde hair??? im getting braces soon and i was planing on getting red white and blue for the forth of july but friend said at her orthodonist they only let you get 2 colors .is this true for most orthodonists? Me too! I wonder if u could get pik green pink green pink, cos that would be awsome! Okay so I’m a teenager, like a lot of people on these comments and my boyfriend has colored braces and I am getting mine September 13th ((Friday 13th, something is bound to go wrong)) and my family is giving me grief that our braces will get stuck when he kisses me… Should I let that get to me? I’m not enjoying their teasing much because I don’t know if it is true or not. I’m getting my braces fitted next week and looking forward to picking to going picking out the colour for my bands. I didnt know there were so many colours to choose from. I think I’m going for something bright! Hi I’m Becky , im 11 and I have just got my orthadonist referall today and even though it seems like a long time away I am wondering about what colour to choose! I will receive treatment from the NHS (uk health service) and I don’t know what colours I can get! I was thinking about glow in the dark because the don’t stain, look clear , don’t make your teeth look a funny colour and well, their glow in the dark! If they don’t offer that colour in bands or braces I would choose silver or pink! Please help me because I’m worried about my braces and don’t know what the NHS provide! I have a question for you. I am getting braces in several weeks, not because I need to straighten my teeth but because I am missing 2 adult teeth on my bottom row of teeth. So when those 2 baby teeth fall out there will be permanent gaps since there is no adult teeth to fill the gaps. So I am getting braces so when those baby teeth fall out the brace will pull the other teeth in to close the gap. I was just wondering if since I have this problem will I be getting colored braces or self-ligating ones? Thanks! And please answer quickly as I really hope I can get colored ones! Ello, all. I was wondering if it is even possible to get colored Damon braces. And I’m not talking about the rubber bands. Just the braces in general. Thanks! I am 10 years old but if I have braces I will like to have red and orange ones. Those colors represents my favourite anime . That is a good idea . My Favourite anime colour is blue and green. I was hoping to get pastel colors. I really like Teal and Violet together. What can you eat after you get braces. My friends getting them soon and I am also. im getting braces soon and i am getting teal and screaming pink i think they will go great together! I had self ligating and you can still choose colors for your powerchains if you need them at any point. And some orthos will put colors for deco if you want them. What’s the difference between power chains and regular bands?? I’ go to Campbell orthodontics, and in 1 week I go to get braces and I’m freaking out, does it hurt?? I hate having anything in my mouth.. But I’m still Super excited about the colors! I think I’m going to get lavender and light blue!! Any other suggestions? I’m 12 year old girl and have bright green eyes and dirty blonde hair. I surf, will it hurt when I go over a wave and my fiberglass board hits my face? Will the metal break my board? Will it hurt my mouth? Will a bracket break off? Please reply ASAP!! I’m getting my braces in a couple of weeks and I don’t know what colour I’m going to get! I’m thinking about lime green and bright blue but I’m still no sure. I have blue eyes and strawberry blonde hair, oh and I’m a girl btw. Please help!!! I’m getting my braces in a couple of weeks and I don’t know what colour I’m going to get! I’m thinking about lime green and bright blue but I’m still no sure. I have blue eyes and strawberry blonde hair, oh and I’m a girl btw. Please help!!!! I believe that having colors is awesome. When I had braces there was no such option. Now my daughter is going to get braces and she wants them pink. It really takes out the stress out of the experience and makes braces trendy. My mom told me when I’m getting braces I have to have teeth pulled out. Is this true. Hi, My dentist said i have to get braces once i loose all of my teeth and i have done that already but my mom and i are having trouble finding the right orthidontist any ideas? I already have some clue about my colors but i have 1 question does the teal color fade because it looks different from the screaming pink? ya Amy thats what I was wondering because they don’t exactly look the same!? I’m getting my braces in two days and I’m having a hard time with picking colors please help me!!!!!!!!!! Hi,I’m getting braces this Friday but I don’t know what colors look good on natural beige skin and dark brown hair?..Please help. What’s the difference between power chains and regular bands?? I go to Bozart family Dentistry and in 1 week I go to get braces and I’m freaking out, does it hurt?? I hate having anything in my mouth.. But I’m still Super excited about the colors! I think I’m going to get lavender and light blue!! Any other suggestions? I’m 13 year old girl and have bright green eyes and dirty blonde hair. I surf, will it hurt when I go over a wave and my fiberglass board hits my face? Will the metal break my board? Will it hurt my mouth? Will a bracket break off? Also I was wondering if someone could reply a link for a good braces procedure video? I want to know what they are going to do before I get my braces.. Regular bands do not pull your teeth but as the power chains they pull your teeth closer together and or back. They may hurt more but they work. No it does not hurt your teeth bit your cheeks will get cramps. Yes you can still surf. I would suggest being careful about falling because if you hit it to hard your braces will get sick to your lip. And I would suggest not getting white as a color it will turn yellow. And don’t get black they make your teeth look dirty 24/7. I will send a link right now hold on. Baby blue and pink go really good with light skin. I’m SOOOO scared!! I’m going to a dentistry program at the University of Alberta where a student will be putting on my braces. I don’t know if they have colours and I’m scared something is going to go wrong. I’m so nervous. I’m going to the University of Alberta dentistry program where a student will be putting on my braces. I don’t know if they have colours and I really want this to be an okay experience for all the pain I will be going through (including 2 surgeries). I’m really nervous. Any tips? Not a big fan of coloured braces to be honest – especially something like yellow/orange – I would worry that from far away it would look like you had really yellow teeth. But I can see how they might be fun for kids so can see the benefits there. If I had to have braces I would probably go for something as invisible as possible such as Invisalign. I am getting braces over the summer before school starts! I am very eager to see my new smile after they are taken off, and I’m glad I won’t have to wear braces in high-school, only in 7th grade (thank you dentist!). I was thinking of doing a light pink (no other colors) because I don’t want my braces to take over my whole look. Otherwise I will probably get lavender or something light but pretty. This article really helped! thanks! Hi I have a dentist oppitment Monday and it’s Saturday and it is just like the every 3-5 months checkup at least I think it is 3-5 IDK. Anyway he already told me I needed braces but since all of my teeth are out and grown in will he send me to my orthodontist? And if he does how long should you say it would take before I can get my braces? Please reply and my mom said colour braces don’t work as good but I don’t believe her I really want colour braces PLEASE REPLY AND TELL ME THE TRUTH. What a cool technology! Anything would be better than the horrible silver machinery I had as a kid. The more I learn about this business the more exciting I realize it is. Fast changing, Very cool. I’m thinking about getting the silver with light pink or green and pink or blue and pink or blue and lavender. Thanks in advance. I get mine in January sometime. Oh and I have blonde hair, blue eyes, and very pale skin. I look like a ghost compared to my friends. Is there any color that could make my skin look darker? Ok so I am 15 mixed with grayish blue eyes I am getting braces tomorrow I already had them once on the top hot pink a aqua but I don’t kno what color to get?? Hi I’ve not long turned 17 and I’m with Airdrie Dental Care I’ve been to the orthodontist a couple of times and I’m supposed to be getting braces (train tracks) top and bottom but I have been told that before I get them I need to get 4 teeth removed before getting them and I don’t know if the colours pink and purple would go?